Life is getting really manic at the moment - I thought I was picking up the school secretary job quite well, but the end of school year procedures have left me stunned - exporting children (!) and importing the new starters, plus parents of 4 year olds wanting to look around the school, other parents who don't plan on accepting their child's place, but have no intention of actually telling us, added to sports day, end of year production and the normal day to day sick children, missing lunches and blocked toilets - by 20th July I will certainly have earned my six week holiday!!!! I know that if I use 2.5 inch strips to make small 9 patches for the orphan blocks they come out at 6.5 inches, so I cut my plain blocks to that size too, and calculated back to make pinwheels the same size - except the pinwheel calcs went wrong and they were 1/4 inch too blinking small grrrrr! Wow, you really have been busy and you still have time to work too! 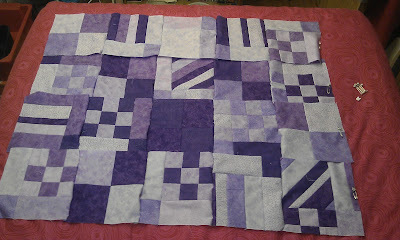 I really like your purple quilt, though with all the different blocks i can see why wanted the drink. It will all look better tomorrow. I did not understand everything you were doing/calculating (probably too tired) but your end result looks great! And you definitely deserve your vacation! I love the colors. I'm especially drawn to the diagonal blocks. Great quilt flimsie! Can't wait to see it quilted. I was a first school secretary for 8 years, it definitely has it's ups and downs!! I just wished they had made Fitflops back then.